In a tiny studio space in the heart of the West End, an intriguing new gender reversed production of William Shakespeare's The Taming of The Shrew is currently playing. Staged in the small studio space Upstairs at The Arts, Custom/Practice's gender reversed production of The Taming of The Shrew couldn't have found a more appropriate performance space. The stage was small and claustrophobic and served to emphasise the entrapment of Katherina at the hands of Petruchio in the play. Production designer Anna Driftmeier's rather lavish looking, if minimalistic set shared many conventions with traditional Jacobean stages, such as a hiding space (a pillar and a curtain), several entrances and exits and a place where the actor could appear higher than others. That, combined with the minimalist and symbolic use of props, harkened back to the play's original staging conditions, while simultaneously skewing them. A theme which ran throughout the play. Use of costume in the production was also interesting, and served to further blur the lines between the traditionally 'male' and 'female', with the female cast members sporting ruffs and male cast members wearing corsets and heels. Although I enjoyed the subversion of traditional gendered clothing, the mixture of clothing styles meant that the piece did not appear to be linked to any particular time period, and although this was doubtlessly intentional, it was a rather distracting element. However, the idea of men playing women in Shakespearean plays has long been a fascinating one, as it gives modern day audiences an idea of how the boy players of the 1600s may have been perceived on stage. However, in Custom/Practice's reimagining, it is the female actors playing the male roles which are most interesting. Brigid Lohrey showed a wonderfully entertaining mastery of physical comedy as Gremio and Eugenia Caruso made Hortensio her own and got some fantastic laughs, particularly during some fourth wall breaking moments in the second act. It was Martina Laird's arresting Petruchio which really stole the show though. Commanding the space with ease and exuding an imposing air every time she was on stage, Laird gave her character a rather sinister edge, and yet was also convincing as the romantic lead of the show. Notably her onstage chemistry with Kazeem Tosin Amore's corseted Katherina was also tangible. 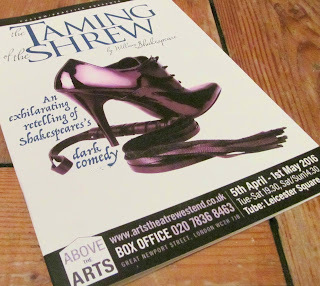 Although the play itself does perpetuate some nasty misogynistic themes which gender reversal does little to curtail, Custom/Practice's gender reversed production of The Taming of The Shrew was executed with energy and passion and comedic flair, and certainly made for an enjoyable night out. The Taming of The Shrew is playing Upstairs at The Arts until May 1st.